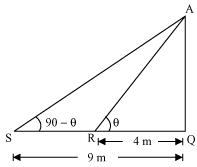 NCERT Solutions for Class 10 Math Chapter 9 Some Applications Of Trigonometry are provided here with simple step-by-step explanations. These solutions for Some Applications Of Trigonometry are extremely popular among class 10 students for Math Some Applications Of Trigonometry Solutions come handy for quickly completing your homework and preparing for exams. All questions and answers from the NCERT Book of class 10 Math Chapter 9 are provided here for you for free. You will also love the ad-free experience on Meritnation’s NCERT Solutions. All NCERT Solutions for class 10 Math are prepared by experts and are 100% accurate. A circus artist is climbing a 20 m long rope, which is tightly stretched and tied from the top of a vertical pole to the ground. 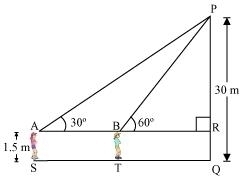 Find the height of the pole, if the angle made by the rope with the ground level is 30 °. It can be observed from the figure that AB is the pole. 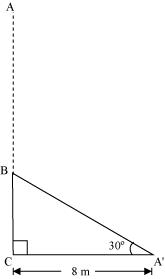 Therefore, the height of the pole is 10 m.
A tree breaks due to storm and the broken part bends so that the top of the tree touches the ground making an angle 30 ° with it. The distance between the foot of the tree to the point where the top touches the ground is 8 m. Find the height of the tree. Let AC was the original tree. Due to storm, it was broken into two parts. The broken part is making 30° with the ground. Hence, the height of the tree is . A contractor plans to install two slides for the children to play in a park. 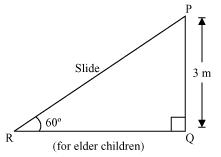 For the children below the age of 5 years, she prefers to have a slide whose top is at a height of 1.5 m, and is inclined at an angle of 30 ° to the ground, where as for the elder children she wants to have a steep side at a height of 3 m, and inclined at an angle of 60 ° to the ground. What should be the length of the slide in each case? It can be observed that AC and PR are the slides for younger and elder children respectively. Therefore, the lengths of these slides are 3 m and . 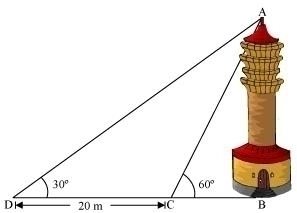 The angle of elevation of the top of a tower from a point on the ground, which is 30 m away from the foot of the tower is 30°. Find the height of the tower. Therefore, the height of the tower is . A kite is flying at a height of 60 m above the ground. The string attached to the kite is temporarily tied to a point on the ground. The inclination of the string with the ground is 60°. Find the length of the string, assuming that there is no slack in the string. Let K be the kite and the string is tied to point P on the ground. Hence, the length of the string is . A 1.5 m tall boy is standing at some distance from a 30 m tall building. The angle of elevation from his eyes to the top of the building increases from 30° to 60° as he walks towards the building. Find the distance he walked towards the building. Let the boy was standing at point S initially. He walked towards the building and reached at point T.
Hence, he walked towards the building. From a point on the ground, the angles of elevation of the bottom and the top of a transmission tower fixed at the top of a 20 m high building are 45° and 60° respectively. Find the height of the tower. Let BC be the building, AB be the transmission tower, and D be the point on the ground from where the elevation angles are to be measured. Therefore, the height of the transmission tower is m.
A statue, 1.6 m tall, stands on a top of pedestal, from a point on the ground, the angle of elevation of the top of statue is 60° and from the same point the angle of elevation of the top of the pedestal is 45 °. Find the height of the pedestal. Let AB be the statue, BC be the pedestal, and D be the point on the ground from where the elevation angles are to be measured. Therefore, the height of the pedestal is 0.8 m.
30° and the angle of elevation of the top of the tower from the foot of the building is 60°. If the tower is 50 m high, find the height of the building. Let AB be the building and CD be the tower. Therefore, the height of the building is . Two poles of equal heights are standing opposite each other an either side of the road, which is 80 m wide. From a point between them on the road, the angles of elevation of the top of the poles are 60° and 30º, respectively. Find the height of poles and the distance of the point from the poles. Let AB and CD be the poles and O is the point from where the elevation angles are measured. Therefore, the height of poles is and the point is 20 m and 60 m far from these poles. A TV tower stands vertically on a bank of a canal. From a point on the other bank directly opposite the tower the angle of elevation of the top of the tower is 60°. From another point 20 m away from this point on the line joining this point to the foot of the tower, the angle of elevation of the top of the tower is 30°. Find the height of the tower and the width of the canal. From the top of a 7 m high building, the angle of elevation of the top of a cable tower is 60° and the angle of depression of its foot is 45°. Determine the height of the tower. Let AB be a building and CD be a cable tower. Therefore, the height of the cable tower is . As observed from the top of a 75 m high lighthouse from the sea-level, the angles of depression of two ships are 30° and 45°. If one ship is exactly behind the other on the same side of the lighthouse, find the distance between the two ships. Let AB be the lighthouse and the two ships be at point C and D respectively. Therefore, the distance between the two ships is m.
A 1.2 m tall girl spots a balloon moving with the wind in a horizontal line at a height of 88.2 m from the ground. 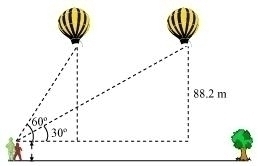 The angle of elevation of the balloon from the eyes of the girl at any instant is 60°. After some time, the angle of elevation reduces to 30°. Find the distance travelled by the balloon during the interval. Let the initial position A of balloon change to B after some time and CD be the girl. A straight highway leads to the foot of a tower. A man standing at the top of the tower observes a car as an angle of depression of 30°, which is approaching the foot of the tower with a uniform speed. Six seconds later, the angle of depression of the car is found to be 60°. Find the time taken by the car to reach the foot of the tower from this point. Let AB be the tower. Initial position of the car is C, which changes to D after six seconds. 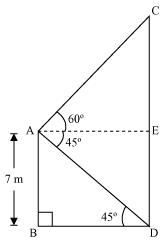 The angles of elevation of the top of a tower from two points at a distance of 4 m and 9 m. from the base of the tower and in the same straight line with it are complementary. Prove that the height of the tower is 6 m.
Let AQ be the tower and R, S are the points 4m, 9m away from the base of the tower respectively. The angles are complementary. 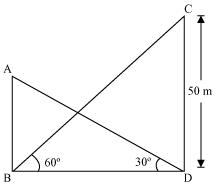 Therefore, if one angle is θ, the other will be 90 − θ. However, height cannot be negative. Therefore, the height of the tower is 6 m.